I was a "Drive-in-wanna-be" until this weekend. I had never ever been to one but it was on my bucket list. When we were asked by a group of friends to go this weekend it was too good a chance to pass up. It's winter here so we knew it was going to be really cold and we gladly accepted all nuggets of wisdom from our Aussie friends. The back of the car was stuffed with duvets, pillows, sleeping bags, woollie beanie hats, a big flask of Hot Chocolate to insulate the kids and a bottle of red wine for the grown ups! We gathered in the local town and drove in convoy to Heddon Greta. The cars were reversed into spaces side by side. 11 kids jumped from car to car looking for one with their friends and the comfiest blankets and best snacks. The grown ups lined up camp chairs in a row in front and passed along snacks and wine glasses. Some grown ups were designated drivers (sigh) and some took full advantage of this. I'm just saying Mr B....! The next few hours passed in a blur of Mr Poppers Penguins and Cars 2 and lots of layering up in blankets and seeing our breath fog as we laughed. I loved it. I can't believe we have been here in Australia for almost 6 years and this was our first time to take advantage of such a fun experience. This is not simply something to strike off the list of things-to-do-before-I-die. This is a repeat performance waiting to happen! 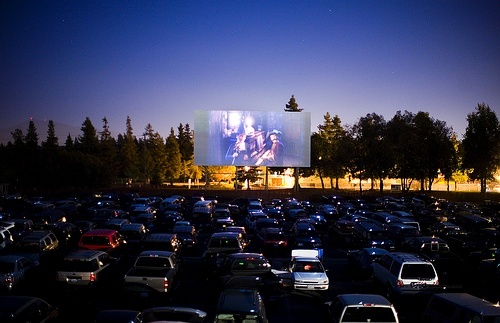 Ever since Grease I've wanted to go to a drive in! I wondered how it would work without the open top cars though - and now I know! Once upon a time there were drive-in movies all over...I don't know if there are any left in my area now. I can remember when we were kids going with my parents...they would show a kids movie first then the kids would go to sleep in the back seats while the parents enjoyed the grown up movie. When I became older I would go with my friends. We would all pile into a large van and back it up towards the screen, open the rear doors and watch from either the inside or out. I never got to take my daughters but they did get a chance to go when they visited their father one summer. I would love if one would open up again in our area!